"This was a spur of the moment recipe I made to use the ham bone left from Easter. It's really easy and tastes great on a cold evening!" Place 15-bean soup mix in a large bowl and cover with several inches of cool water; soak in refrigerator 8 hours to overnight. Drain and rinse. 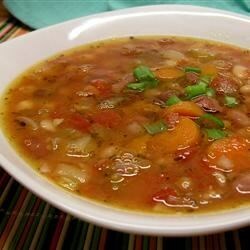 Place 15-bean soup mix, ham bone, cooked ham, chicken broth, water, onion, carrots, great Northern beans, garlic, black pepper, salt, and bay leaf in a slow cooker; stir to combine. Cook on Low for 8 to 10 hours. Taste like a lot of beans. If that's your thing I say go for it. This was delicious! I added more liquid and a can of diced tomatoes. It was even better on the second day. A great meal with some hearty bread or a grilled cheese sandwich. This was delicious. I left out the ham bone...didn't have one and added a can of chopped tomatoes. The whole family loved it!!! Absolutely delicious! Will make again soon. Added a 1/2 cup tomato sauce and 1 tsp siracha hot sauce to give a little zip.,was amazing!